Though you may not have heard much about SimpleSite in this past, this boutique website builder has some surprising features to offer. But how does SimpleSite stack up against the competition? There’s no such thing as a perfect website builder, as each different platform has its own set of benefits and drawbacks. Here’s a quick look at where SimpleSite excels as a platform, as well as where it falls short. Founded in 2003 by a pair of Danish brothers, SimpleSite is a Denmark-based company that offers a well-rounded website builder with free and paid plans. SimpleSite’s brand promise is to provide a platform that makes it easy for individuals of any experience level to create a great-looking website in less than 3 minutes. And thanks to the streamlined SimpleSite sign-up process, it’s actually possible to do just that. 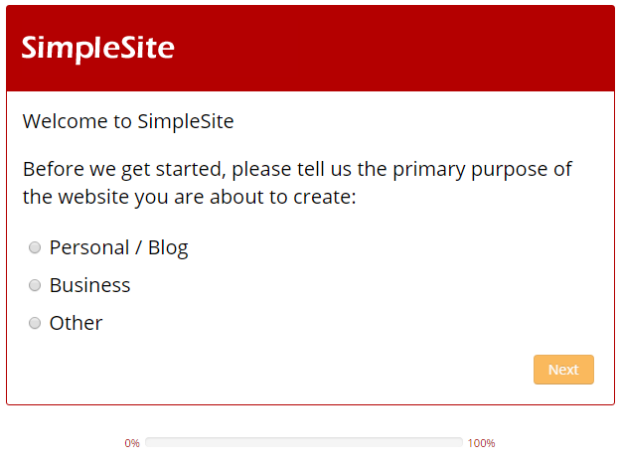 No matter what kind of project you’re working on, be it a blog or an online store, you can use SimpleSite to make your own website in far less time than you might imagine. In fact, more than 17 million bloggers, businesses, and individuals around the world already have SimpleSite websites as their gateway to the Internet. And since you can try out the service without entering any credit card info, why not test the builder to see if it’s right for you? SimpleSite touts itself as an ideal tool for businesses, social clubs, bloggers, hobbyists, and job seekers. That may be casting a bit of a wide net, but it’s true that you can use the SimpleSite builder to create an attractive online presence for any of these purposes. It really is as easy as creating a website login, choosing a look and feel that you like, then adding your great content. However, one of my criticisms about the selection of SimpleSite designs to choose from is that they all have the same basic structure and don’t allow much deviation from that. The standard SimpleSite layout consists of a large image aligned with the left side of the screen, accompanied by a sidebar on the right side, and your choice of one, two, or three columns beneath the main graphic. Yes, you can customize the type of content you put in these spaces, but you’re still stuck with that standard overall framework. 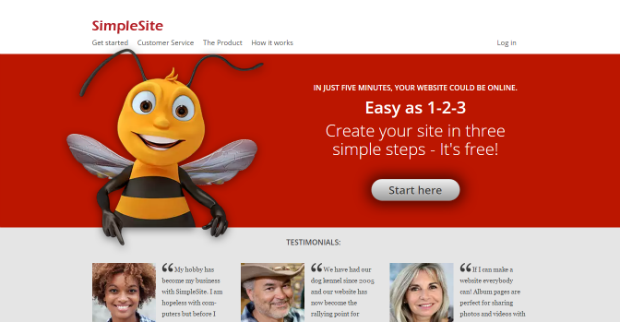 While many of the other top website builders offer hundreds of themes to choose from, there are just 15 basic SimpleSite templates in this company’s gallery. And since all of the templates have the same basic structure, there’s not really a ton of variety in this department. 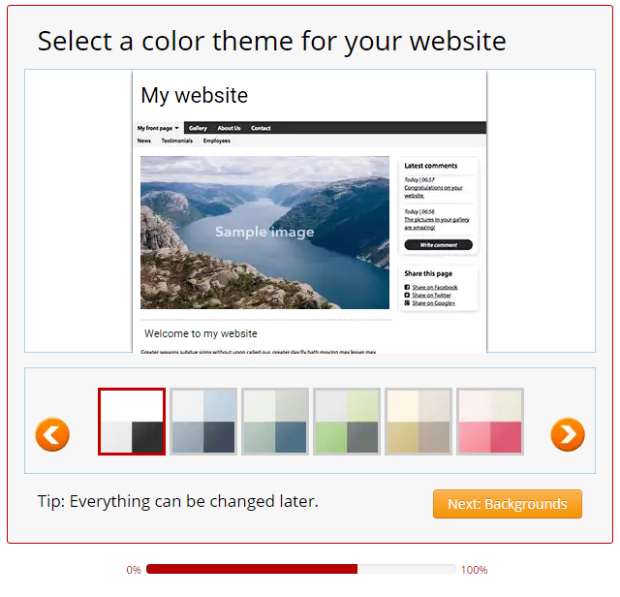 It is important to note, though, that the SimpleSite builder gives users the option to customize their theme of choice with up to 35 different color schemes and 25 different Web fonts. Some of these fonts, however, require an upgrade to the SimpleSite Pro plan. SimpleSite websites may not be the most advanced sites around, but as the company’s name implies, they are among the easiest to set up. Just visit SimpleSite, sign up for a free account, and then begin the building process. 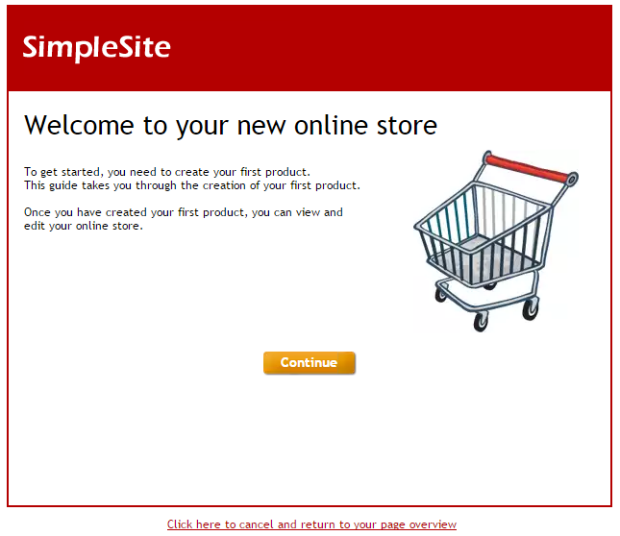 Less than 10 minutes after I created an account on SimpleSite, my test site was up and running. 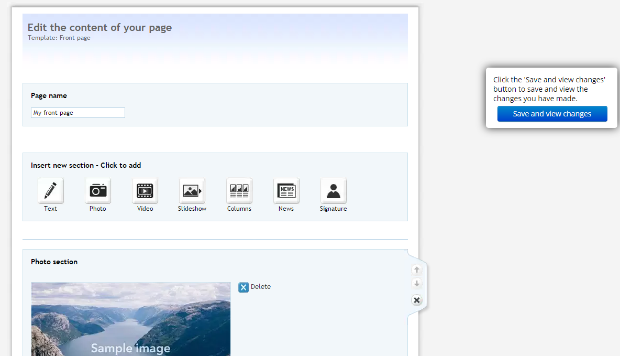 Adding text and images couldn’t have been easier, while embedding videos and slideshows was almost as effortless. Beyond that, there are a few neat little SimpleSite apps, which could further extend the functionality of my site. And I was even able to see how much traffic my SimpleSite pages receive, thanks to the built-in analytics. SimpleSite offer you a completely free basic option for building a starter website, using all their excellent website building tools. You are allowed 15 pages, 300 images, up to 600 seconds of video and even PayPal integration with up to 5 products, all completely free. For unlimited pages, media, design options, a free domain name, custom email addresses and no ads on your website, you will need to upgrade to Pro. Ecommerce offers all of the above, plus unlimited products in your online store. Despite the fact that the SimpleSite maker lacks some features commonly offered by more modern builders, this platform holds its own when it comes to smartphones and other devices with smaller screens. All sites created with this tool are automatically optimized to display well wherever they’re viewed, no matter what plan you’re on. So even though I didn’t sign up for a paid SimpleSite plan, the software still adjusted my site to look great phones and tablets. This is a fantastic feature to have because more than half of today’s Web traffic originates from handheld devices. Plus, most other builders don’t offer mobile responsiveness as a standard feature across the board, making this a standout aspect for SimpleSite. If you wish to edit your site while on the go, SimpleSite also allows you to this on most smartphones and tablets. Not only is it straight up easy to create a SimpleSite with an online store, but Ecommerce capabilities are included by default with all of this builder’s plans. Similar to the free tier, SimpleSite Pro plans allow for just five products in your store, but the full-on Ecommerce plan gives you the freedom to sell as many different items as you’d like, and include an unlimited number of images. I found the process of setting up my store to be straightforward and painless, but it was good to know that the SimpleSite wiki was available in case I became stuck at any point. True to its brand name, this website builder really is one of the easiest-to-use platforms out there. After signing up for an account, the SimpleSite tutorial wizard walked me through the basic steps of getting started. Beyond that, I was more or less on my own. There is a SimpleSite phone number listed on their contact page, but it’s a number in Denmark, and it isn’t advertised as a line to call for technical support. It soon became clear to me that customer service isn’t quite SimpleSite’s strongest suit. If you get stuck, there’s no SimpleSite contact number to call, and the company doesn’t offer chat support, either. There is an FAQ available, but not a true SimpleSite forum where customers engage with each other to find the answers they seek. The only actual form of SimpleSite customer service is to email customerservice@simplesite.com, but it could take up to two days before you hear anything back. SimpleSite websites are SEO optimized (out of the box), making it really simple and easy for users to optimize their websites for search engines. The mobile responsiveness and speedy loading times are a huge must-have when it comes to modern SEO, and SimpleSite offers both. Furthermore, users can find useful SEO guides for beginners on how to optimize their SimpleSite website most effectively. Hosting is included for no additional charge with all of this website builder’s packages, though unless you upgrade to a paid plan, you’ll be stuck using a SimpleSite domain (e.g. yourgreatsite.simplesite.com). To link your site with a domain name of your choosing, you’ll need to shell out some cash for either the Pro or Ecommerce plans. The good news is that with those plans, you can lock down a domain name without incurring an additional charge. In order to use email with your SimpleSite account, you’ll need to upgrade from the Basic plan to one of the paid plans. When you do that, you’ll have the ability to create up to five different email addresses associated with your domain. Once that’s done, you can easily access your inbox by using your SimpleSite login. The platform even gives you an easy way to share your new website with everyone in your address book. By upgrading to a paid account, you’ll also have access to other standard email options, including the creation of an email signature to appear after all of your messages. Though this builder isn’t one of the best-known platforms around, the folks who use it seem to be relatively happy with their decision to do so. Most SimpleSite reviews commend the platform for its ease of use, but more seasoned webmasters are often let down by the lack of some features commonly provided by other builders. A quick search for SimpleSite blog reviews will lead you to some critical articles that condemn the builder for its lack of features in comparison to the competition. Though it hasn’t always been the case with this builder, you can now use it to build and host a free website for as long as you want. SimpleSite free websites do come with their limitations, though. For one, you’re stuck using a simplesite.com domain name, and you’re severely limited in terms of how many pages and images your site has. If your needs truly are basic, though, this builder is definitely worth considering. Overall, I found SimpleSite to be a surprisingly solid builder, despite the fact that the software isn’t quite as cutting-edge as many other popular builders on the market today. If I just needed to build a site that’s less than five pages, and which isn’t very image-heavy, this builder would be a distinct option. Folks looking for more than that, though, may wish to take their business elsewhere.